Congrats. I own its fraternal twin. SLT PP 5.3, 8Spd, 3.42 in red quartz tintcoat. Only difference is the wheels. Bought last April for $13k off the $57k sticker. Love the truck unconditionally. Lose the E rated big tires and back off the hammer to 75 or lower and it might be worth it. Otherwise, likely not worth it. You certainly won't save enough on fuel to make up the price difference. 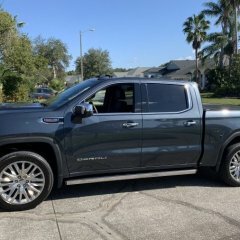 Not really concerned about the topper, a tonneau cover can actually improve mileage over an open bed, so I can't imagine a topper will hurt you that much. It's the heavy, aggressive tires and high speed that will kill you. It costs money to go fast. On my truck, with factory P rated 32" tires, you take a big hit increasing cruising speed from 70 to 80. Can't speak to the K2; I haven't had to touch my brakes yet, but on my 2008, torque specs called for 100 ft-lbs on the caliper brackets and 50ft-lbs on the caliper mounting bolts. Poll: How has your 8-speed been for you? Of course we hear lot of complaints on the 8L90 transmission shuddering and banging. I'm just wondering how many out there have been problem free, since folks with problems seem to be the most vocal (rightfully so). 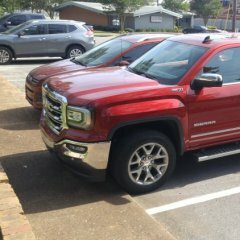 My 9 month old 2018 5.3 SLT PP with 14,000 miles has been flawless except a little thud going from Reverse to Drive when the truck had less than 1,000 miles. How's yours? Bad rear end or brakes locking up? It's likely just the G80 locking up when you spin the tires. The thud you likely often hear is it locking or unlocking. An inattentive lady bent my bedside when she backed into it with less than 3k miles on my new 18. I used the dealer body shop. Manager was good enough to get me a whole new bedside instead of bondo. He mentioned to me that his shop doesn't straighten frames PERIOD. Any bent frame on a K2 or newer truck means they order a new frame and transplant the truck onto it. My guess is the at-fault party's insurance company pushed hard to get them to do it on the cheap. I'd personally be pretty PO'd at the body shop for giving in. 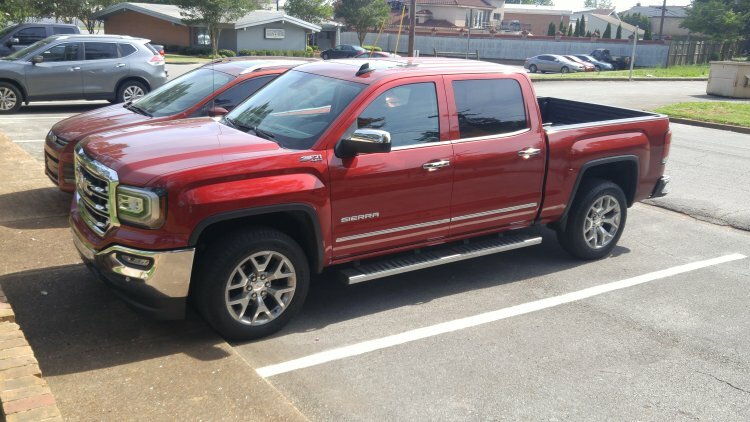 2016 Denali 5.3 w/8spd...any issues, problems, known troubles ? Too much $$$ IMO. I think you could get a new 2018 LT CC 5.3 6-speed 4x4 for close to that number if you shopped around. Because you're posting in the K2 2014-2018 forum, not the GMT-900 (07-13) forum would be my guess. Gen IV engines took the PF48, the new Ecotec Gen V engines take the PF63. They're putting a whole new bedside panel on mine. She also got the taillight which is $675 by itself. I'll give her credit. At least she was honest enough to leave a note (and after 2 old ladies chased her down yelling about a felony) she called the police on herself and got a report made with her on the record as admitting fault. All that's left is to wrangle with her insurance co over diminished value and take it in to get it fixed. Double ouch. You definitely have my sympathies. Body shop estimate on mine is $2900. And some dumb hairdresser already backed into it and bent it. Less than 4k miles. There are several messaging apps out there that are android auto compatible that do a better job at this. Just google android auto messaging app.